Preheat oven to 190°C. Grease and line your lamington tray (you could also use two square cake tins). Whisk eggs, pandan essence and sugar in a heatproof bowl over a saucepan of gently simmering water for 5-10 minutes or until light and frothy. (This helps dissolve the sugar and also assists in increasing volume.) Squeeze in 6-8 drops of green food colouring – enough to give it a festive green hue! Transfer to an electric mixer and whisk on high speed in a large mixing bowl for 10 minutes or until mixture has tripled in volume. Sift over plain flour in batches and, using a metal spoon, fold gently to combine between additions. Just before adding the last of the flour, fold through melted butter. Pour into prepared tin(s) and bake in centre of oven for 20 minutes or until a skewer comes out clean. Stand in pans on wire racks for 10 minutes, then turn out onto racks and cool completely. For the white chocolate coating, combine chocolate and cream in a heatproof bowl over a saucepan of gently simmering water. When the chocolate begins to melt, stir gently until combined and smooth and set aside in a warm place. Scatter shredded coconut over a tray. Cut the cake(s) into 4-5cm squares. Using 2 forks, dip each square into the ganache and shake or scrape off excess chocolate. (If ganache starts to thicken, place bowl over gently simmering water to thin.) Roll each square in coconut, shake off excess and place on a wire rack to set. Stand for at least 1 hour or until chocolate sets. Store in an airtight container in a cool dry place for up to 3 days. 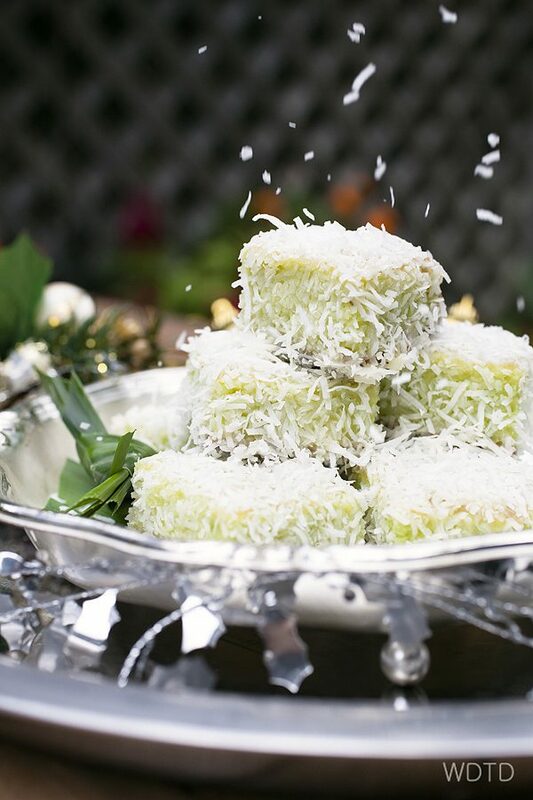 This entry was posted in Desserts, The DIshes and tagged lamington, pandan, shredded coconut. Bookmark the permalink.